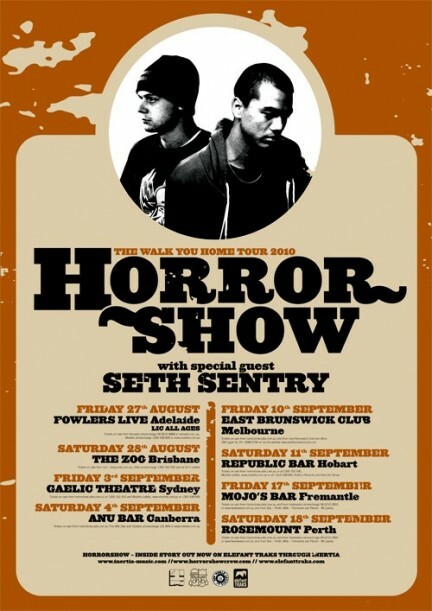 Horrorshow head out on the road again with another 2010 national tour, this time pulling a long Seth Sentry for the ride. This will be the 3rd time Horrorshow have toured nationally in 2010, after their Inside Story Tour in February – March, then touring with Urthboy on the Sneakquel Tour in April – May. Seth’s no stranger to touring either after having toured nationally in late 2009 with The Waitress Song Tour and having various other sporadic cross-country adventures since then.